BODY…1. Begin by taping or simply holding an end of the yarn at the bottom of your wrapping board/book. Loop the yarn loosely around the book lengthwise. 2. Keep wrapping the yarn around the book. On the last wrap, end the yarn at the bottom of the book. The more times you wrap, the thicker the doll will be. The ‘Video Box Sample’ is wrapped 95 times. 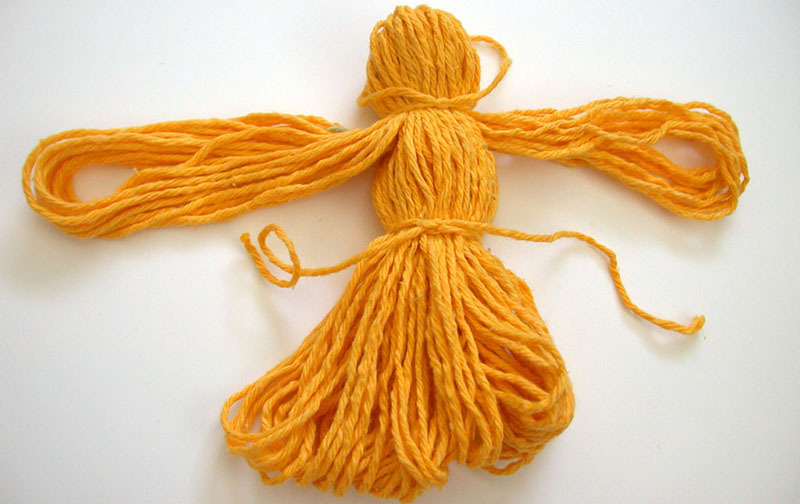 The thickness of the yarn used–determines the fullness of the doll. How tall you make your dolls will determine how many times you wrap the body. If you want to make yours doll larger or smaller, experiment until you find satisfying proportions. Depending on size–you’ll usually need 80 to 200 wraps. Do not stretch the yarn while you are wrapping. When you remove the yarn from the cardboard or book, it will “shrink” and resume its un-stretched state. 3. Carefully slip a piece of yarn around 10″ long under the yarn at the top of the board; tie it in a tight knot. Slip the tied yarn off of the book. At times it is easier for me to slide the yarn (while holding it tightly) off of the board. Tie it when it comes off the board. Siding down tightly–tie another piece of string about an inch or more down (depending on length of doll) below the top knot to create a tight, round head. Pull out a few loops on each side the be the doll’s arms. In the middle section of yarn, tie a string tightly where you’d like her/his waist to be. Tie the arms at the “wrists” and trim the looped yarn ends. Evenly clip the loops at the bottom of the doll. If you want a girl-you now have a ‘skirt’. If you want a boy–split the skirt in the center into 2 parts from the waist down. Tie them off as you did the arms. If legs are long enough, you could also braid them. Decorate as desired…I gave this doll a flop of hair. This ‘hair-do’ was made by wrapping yarn around a width of two fingers. Slide it off the fingers–tie in the center–tie at the top of the head. Snip the loops for a fringe of hair! 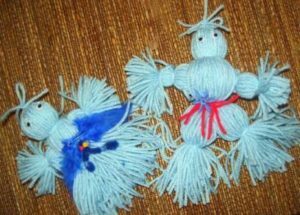 Make ‘YARN DOLL ORNAMENTS’. This doll was made in 1990, and still makes it to the tree each year! Make a HALLOWEEN GHOST! After you’ve made the head–stop! Just trim the bottom loops and add google eyes and a spooky plastic spider! Making an octopus can be easy! Follow the general directions up to the head.